The most iconic of Filipino food, adobo is a dish of meat, or meat and vegetables, braised in vinegar, garlic, peppercorns and bay leaf. 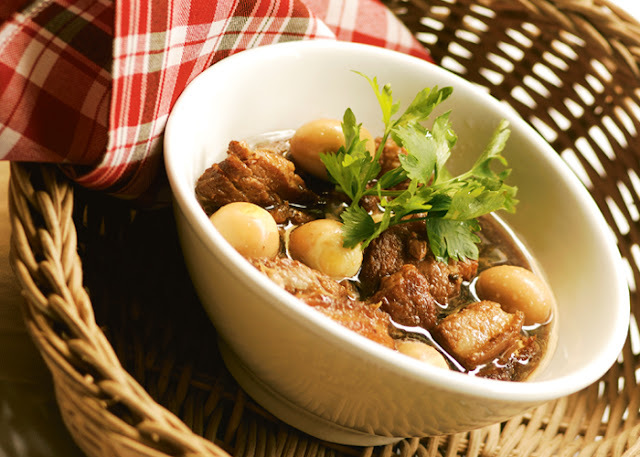 This recipe is for the universally loved pork adobo with soy sauce. Quail eggs make an interesting addition to the dish. 1. Combine soy sauce, vinegar, water, sugar, bay leaves, garlic, dried oregano, salt, pepper and liempo. 2. Boil, covered then simmer till tender. 3. Add dried banana blossom and quail eggs when almost done.